Update 15 Feb 2010: after a few months of meticulous supportive care in one of Mickaboo`s best foster homes, we have a clean bill of health and are ready to be adopted! We have grown comfortable and secure and are ready to make new friends. Hello, we`re Flora (in front) and Precious. 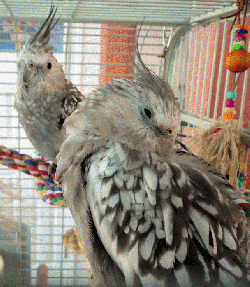 First off, our color scheme is called a charcoal pearly white-faced mutation, which means that we`re white-ish cockatiels with charcoal dappling and pearl-shaped markings. Yes, we are distinctive looking. You might think that a couple of gorgeous women like us would have an easy life and would receive only the best of care. We`d like to set you straight on that. On the day that we were rescued, our foster mom, a veterinary technician, described us as "dehydrated, dirty, scared, confused, and not well kept in general." That`s a little bit embarrassing to us but we know that it`s not our fault. We had lived for a while without basic neccessities such as healthy food, clean water, and a place to bathe. Our first few days in foster care were pretty hard since we were scared of everything and not feeling well but we are doing better day by day. We have a large clean cage with toys and good food and we are starting to eat pellets and broccoli. Since we are best friends, we give each other strength and courage. We`ve already been to the doctor and he says that we need to get healthier and stronger before we can be adopted. Mickaboo is hopeful that, with the good care that our foster mom is providing, we`ll feel much better soon. Imagine how pretty we`ll be then! Please check back to see how we are doing.